It kills you every time. When a customer cancels your subscription. It rips your heart apart. Why? After all, you had carefully hand held them through the onboarding experience, responded to every query at an ungodly hour, pruned the product according to their demands, updated them frequently on any new rollout, yet they called it quits. Keeping your customer engaged and excited about your product is a tough job. One bad experience could ruin a lifetime of loyalty. If it makes you feel any better, most businesses (SAAS companies in particular) face 5-7% churn rate annually. Connecting and building a relationship with your customers is a lot easier with videos. No matter how well you write your emails, they cannot lend the personal touch a simple video can deliver. Video content amounts to 74% of the internet traffic. By 2019, videos will make up 80% of internet traffic. The Human brain takes only 250 milliseconds to process visual information. 50% of the brain is involved in processing visual information. But how can you use videos to reduce customer churn? The first time customer experiences your product is the moment of truth. Remember as a kid, you thought that the Soft ball-Milk bottle game at your town carnival was pretty cool? You could get a stuffed teddy for a quarter. The game was quite simple too. Pick a softball, knock over the bottle and take home a teddy. But what seemed like an easy feat was almost impossible when you start tossing the ball from the throw line. Finally, you ended up going home with nothing but disappointment. Similarly, your customer might be pitched on the simplicity of your service at the time of sales. However, when he comes on board he is overwhelmed by the challenges your service presents, however subtle they are. The onus of delivering on the expectation set forth by your sales team is on you now. It is critical to set the tone of his expectation and your relation at this time. 1. The Golden window: Between the time a user signs up for the product and the time he actually experiences it. There is a disproportionate number of customers who fall off the grid because they don’t like the service, find it too difficult to comprehend or feel it is too cluttered for their business. 2. End of free trial: The customer is still stuck on to his initial apprehensions and lack of clarity about your service, thereby leading him to abandon the service. Customer onboarding is a crucial step to retain your customers. If you want your customers to “stick” to your product, it is good to handhold them through the benefits and use-cases of the service. It is even better to help them experience the value of your service right away. With the power of videos, onboarding process has never been simpler. For example, Your customer recently set up his Instagram account. The immediate value addition would be to help him share a pic. Educating him on filters and effects would be a great way to gently prod him into investing more time. A simple explainer video that reinforces the benefits of your service in a visually enticing manner could deliver the “WOW” moment for your customer. Onboarding is also the perfect time to set the tone of your relationship with your customer. Add a face and lend a voice even to screen recordings, so as to appeal and engage your customers better. The customers find it easy to relate and readily trust a humanized experience. According to a study, 44% of the customers considered videos to be more appealing, 28% found it engaging and authentic while a good 10% thought they are more shareable. This just goes on to reiterate the fact the videos not only drive home the point with ease but only also results in a marked improvement in your customer satisfaction. 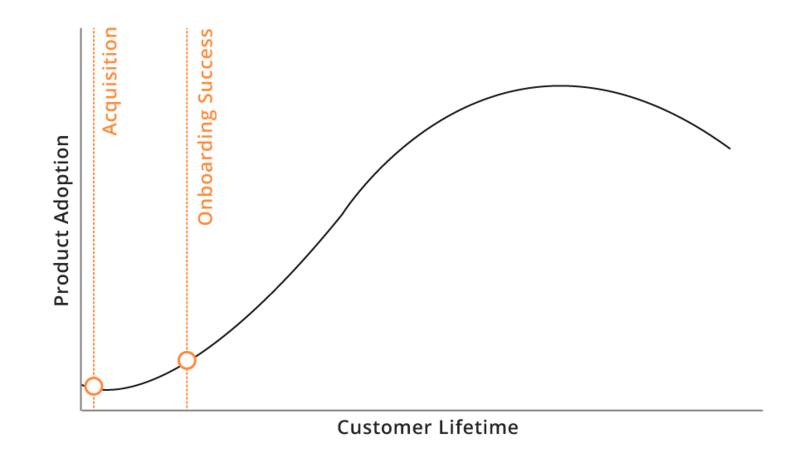 Fighting churn does not end with onboarding. Responding and resolving any issue that your customer’s face is very important to retain them. What would be your turnaround time? Oh, you must be referring to response time. Let me rephrase the question. What would be your average resolution time? Ahem… It’s tricky to calculate, isn’t it? The graph indicates that the average resolution time hovers around 100 hours. 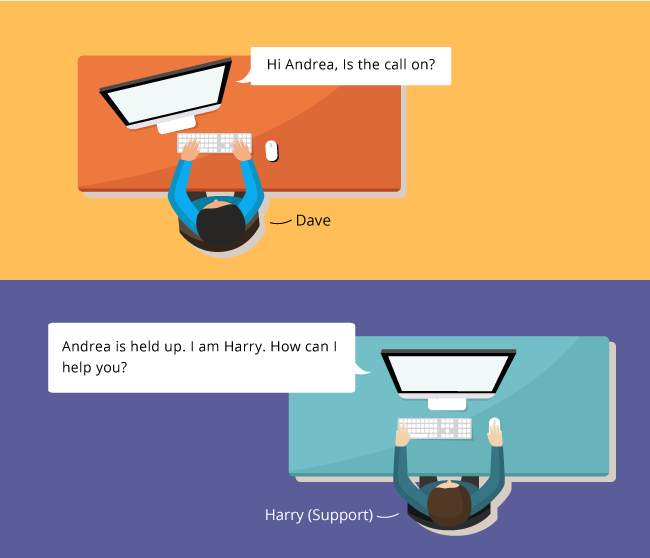 What happens when the support agent is waiting for an information from the customer? Would that be included in the resolution time? So, essentially this means if the support agent winds up with a non-tech savvy customer, the average resolution time will be extended for no mistake on his part. Resolving a customer’s issue as quickly as possible is always a challenge for support teams across the globe. Following up with the expert, gathering information, manually typing out a response to every email prolongs the process further, leaving the customers frustrated. Dave finds another billing software. Oops! That’s how churn happens. Not only are lengthy back and forth email chains frustrating, they eat away a chunk of a support agent productivity. As mentioned in the scenario, the context of the issue is lost when tickets are passed internally. In addition to that, scheduling one on one calls to appease a disgruntled customer across multiple time zones is a horrifying time sink. Videos could capture specific issues and guide your customers on the quickest resolution path. With a cloud based video tool like Hippo Video, customer/agent created videos are available to all support agents and they would be up to speed on the issue so as to deliver a positive customer experience. Creating, editing and embedding videos within your ticketing system can save massive amount of time. Although quick ticket resolution is critical to deliver a positive customer experience, effective communication is necessary to build a rapport with the customer. As a customer success manager, I bet you know this. Customers are not numbers and hate to be treated as tickets. So it comes as no surprise that when asked about what draws to them to a particular brand, they cite superior customer experience as the reason. There is a reason eCommerce giants such as Amazon are pouring funds to humanize customer experience. In fact, the Amazon recommendation engine fondly referred to as ”Soul mate” has been created to curate helpful hints according to specific individual needs. Customers increasingly feel the need to be heard, valued and appreciated. Let’s face it, emails riddled with exclamation marks that are meant to demonstrate your empathy, don’t make the cut! They are boring and offer little value. Most often they are lost in a pile of other mundane emails. They are in a soulless third person’s voice. Sometimes it is easy to be neck deep in process and protocols that you forget to add a dash of your personality. It is unfair to expect customers to be content, let alone be pacified with a hackneyed response. To strike a chord with customers, it is important to show that you care. Capture and retain customers attention with videos that humanize their experience with your service. Build an emotional connection by showcasing that you sympathize and care about their issues. Videos are also easy to share. Hence customers are more likely to spread the word about your business by tweeting or sharing videos through social media channels. Although most customers are turned off when businesses spam them with endless offers, they are happy to consider such gestures when you share a good rapport with them. So, upselling and cross-selling your service can be tailored to their specific requirements when you are well acquainted with their needs. Customers hate to run around in circles when they encounter an issue. They want to fix it immediately. And, they would rather do it themselves. 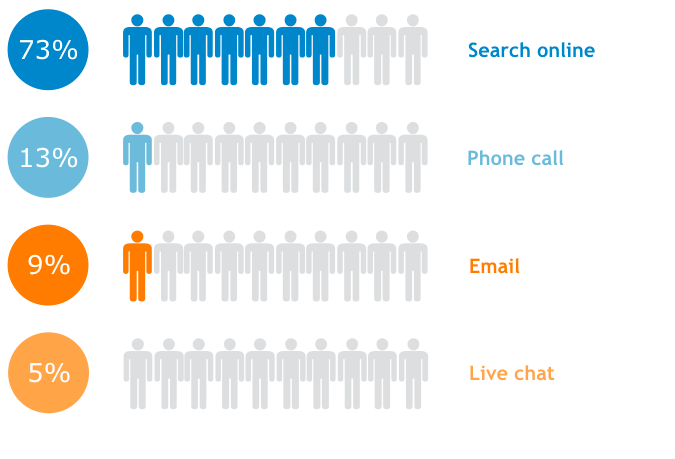 As seen in the graphical representation, 73% of the customers prefer to search for information online. Redirecting the user to a knowledge base is like handing over a user manual that lists out the instructions, the controls and descriptions of the various facets of your service. It has to be simple, readily accessible and easy to navigate. However, most support portals are loaded with confusing and complicated guides that customers, especially technically unsophisticated ones, feel threatened. They resort to placing a call or emailing support, overburdening the front line of your business. Have you ever played the Paper fortune teller game as a kid? The fun game where you have to pick a number and your fortune will be revealed. Do you remember how to make one? It is super simple. Follow the written instructions here or you could watch a video on how to create it here. Which do you think is easier to follow? The worded instruction or the video? Of course, Video it is. Most help docs found on the support portal make your eyes glaze. Your customers have better things to do (like running a business) than read a manual. Videos, on the other hand, can help your customers follow the instructions, understand the features and discover frequently asked questions about your service effortlessly. Customers can also pause, view on it on the go and watch it repeatedly till they get a hang of your service. Most importantly, your team can access a centralized platform to view all the “How-to’s” and product videos that can also be accessed by all your support agents. This reduces the time that support agents spend on grappling for relevant information. While the factors that cause churn are listed, it is important to understand the effect of churn on the growth of a business. A Forrester research states that 80% of your business comes from 20% of your customers. This is why measuring customer churn and crafting a customer-centric business strategy has been gaining momentum. Every business finds it challenging to fight churn. The primary reasons that lead to churn are poor onboarding, inefficient resolution process, bad customer service, and impersonal customer interaction. Undoubtedly, customer success is your formidable defense against churn and Videos, your lightsabers. But, are you willing to wield your weapon to decimate churn? It’s your fight, join us.